A neutron star is the remnant of a large supernova. When a large star explodes, a remnant of its core is compressed so tightly that the electrons are squeezed into protons, resulting in a mass of neutrons. 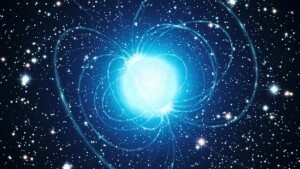 A neutron star typically has a mass of about 2 solar masses, but it is only about 12 kilometers in diameter. Imagine taking two suns and squeeze it into the size of a small city, and you get the idea of how incredibly dense these objects are. Neutron stars are often represented as a simple mass of neutrons, but we know that they actually have a complex structure. Just as the Earth has a crust, mantle and core, a neutron star has an iron crust, neutron mantle and core. We know from variations the rotation rate of pulsars that neutron stars undergo “starquakes”, that they likely have mountains (assuming you can call a rift a couple meters high a mountain range). They are geologically active. We also know they have atmospheres. Just how we observe the atmosphere of a 12 kilometer wide neutron star light years away is pretty interesting. The surface temperature of a young neutron star is about a million Kelvin. This means it radiates a significant amount of light in the x-ray spectrum. If a neutron star had no atmosphere, then light should follow a distribution known as the blackbody curve. In other words, with no atmosphere the x-ray light should depend only on the surface temperature of the neutron star. But if it has an atmosphere, then the atmosphere will absorb some of the light and emit light at a different wavelength. So the x-ray spectrum would measurably differ from a blackbody spectrum. Just how it differs would depend upon the makeup and thickness of the atmosphere. In 2009, Wynn Ho and Craig Heinke published a paper analyzing the x-ray spectrum of a neutron star known as Cassiopeia A. (Actually, Cassiopeia A is the name of the supernova remnant where the neutron star resides.) This is a young neutron star about 11,000 light years away. They found that the x-ray emission did not match a blackbody spectrum well, so they compared the spectrum to various model atmospheres such as pure hydrogen, helium, carbon, nitrogen, and oxygen. They found the best match to be a carbon atmosphere. This carbon atmosphere isn’t like anything we’ve experienced. It’s only about 4 centimeters thick, and while it is “gaseous”, its density is about the same as diamond (3.5 grams/cc). Over time this atmosphere is expected to change. The gravity is so intense that carbon would eventually settle out of the atmosphere while lighter elements such as hydrogen and helium accumulate. Eventually even the lighter elements would settle to the surface. But Cassiopeia A is still young, so for now it can enjoy its diamond sky. where does the hydrogen and Helium come from, and how do they “accumulate” and “settle”, when the gravity of the object was strong enough to fuse its electrons and protons?